Lithium is a type of drug which is used to treat bipolar disorder, schizophrenia and schizoaffective disorder or mood disorder. 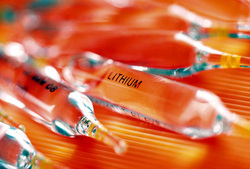 Lithium may have the ability to inhibit the phosphoinositol second messenger cascade which interfere with the synthesis, release, storage and reuptake of the monoamine neurotransmitter. Lithium may increase the action of serotonin. Lithium may also lead to an increase in the level of norepinephrine and dopamine in the levels. Lithium should be avoided due to teratogenic effect in pregnant woman. The common side effects of lithium may include leukocytosis, edema, fine hand tremor, hypothyroidism and changes in the ECG as well as nephrogenic diabetes insipidus.